Fleaheart is now an incorporated business entity. If you're not into that bit of professionalism and usefulness there is also Twitter, the opposite of professionalism and usefulness. Need to mention a collaboration I've been working pretty hard on lately with longtime friend Jeremy aka 'The Heat' of Tacklebox. This past winter we somehow decided our shared upbringing amongst tractors and forest-bound-boats was the perfect foundation for a fashion accessory line. 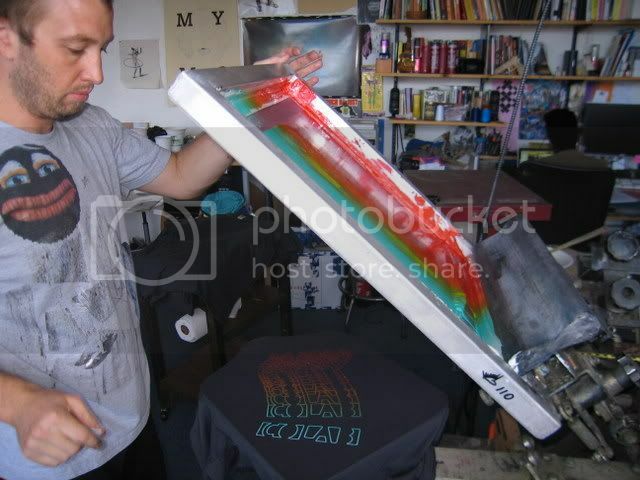 Jeremy curing an early test print. 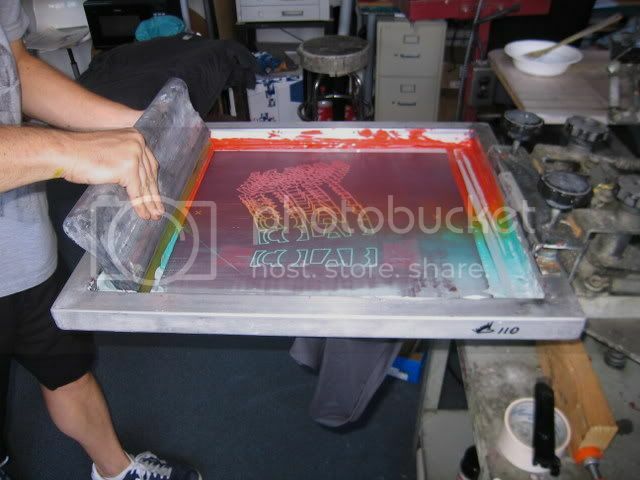 Ties are optional but recommended when screen printing. I look like I am doing something incorrectly here. Here are some hopeful bandana candidates. We have developed and printed about 10 of these and are currently working on a tool tote, ties, and leather items. So all in all it's been a welcome outlet for two architect's creative surplus, a great way to take advantage of the resources of the studio, and a great testing ground for perfecting new processes. Stay tuned for more and check us out at Smith + Butler. Continuing the starchitecture desctuctication kick I had this image of a fire at Zaha Hadid's Opera House in Guangzhou. This was combined with some beautiful open trusses that used to be the view out the studio window. This has since been roofed over unfortunately but I heard that the developer who bought the property intended to flip it and had already poured foundations for a 12 story luxury condo building here. I should count my blessings since it was not approved, as this whole Greenpoint Pencil Factory complex is landmarked. Too bad the "Pencil Factory Lofts" was approved which eliminated my view of the river with it's sample-color-swatch-board-of-brick design. Genius. They must be having funding troubles with the economic meltdown as what was originally a frantic pace has slowed to single CMU blocks being raised by rope and pully one at a time. Rounding out this collage was a part of a previous collage i made to illustrate an essay for Marco Frascari. The 'building' on the water is a drawer of prosthetic eyeballs and the background is a wiring schematic for a Commodore 64. This drawing was part of a series I made while living in Pittsburgh. The '02' was from a spanish-word-a-day calendar but I had crossed out the word so I evidently didn't learn anything. Master Blender Chris P. sports a custom hairy meatball shirt. A tricky print but a fun challenge as each shirt is slightly different. The water based inks have a metallic binder added and a clear discharge underbase keeps everything super soft. Shirt design by Studio Mercury and printed on Alternative Apparel Organic. A true collaborative effort in the studio... Yego on the design, Mimi on the construction, S’aint Yacque for putting in the black & gold chain neck strap, adorned with both coyote & buffalo teeth!!! and King Texas did the awesome photography. Visit Dante's site here. Boredoms - Video of printing here. Screen Printed CD's... more on this later. Do we print newspapers? uh yes.